Spatial data is now critical for every organization, driving more accurate decision-making and planning. But as the power of spatial data increases, evolving standards and the ever-expanding range of formats have become a big challenge. With the market-leading FME software suite from Safe Software and Globema tools & expertise in data processing, spatial data interoperability is no longer a problem! Incompatible data formats are a major barrier to moving data between applications. Easily move past these challenges with FME’s unparalleled format support and data conversion capabilities. FME enables you to efficiently translate data for use in almost any software solution. FME supports over 450 spatial and non-spatial data formats (including the most popular DWF / DWG, Smallworld, Bentley Microstation Design, ESRI Shape, GeoTIFF, MapInfo TAB, Oracle Spatial). With more than 500 different transformers and support for more than 5,300 coordinate systems, FME gives you unlimited flexibility to manipulate the geometry and attributes of your spatial data. The data are not only available for editing, but can also be shared. FME also improves the process of data control and quality assurance. 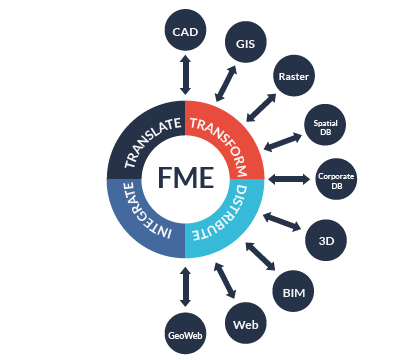 Today, being constantly developed, FME is the dominant technology for spatial data transformation. It powers the FME Desktop and FME Server software and the solutions of more leading spatial data application vendors than any other technology. It’s used by tens of thousands of customers worldwide across a wide range of industries. Any problem with spatial data? We can help! Globema offers a full range of services related to the implementation and use of FME. We provide technical support, knowledge transfer and trainings, software development and implementation consulting. We hold FME Certified Trainer and FME Certified Professional certificates, confirming the highest skills in the use of FME. A team of experts – practitioners to use FME – has both in-depth knowledge and extensive experience in information technology and managing spatial data.